If you were hesitant about joining the throngs of paddlers that fill popular rivers like the Manistee and Pine on summer weekends, take heart, the pressure on these streams is noticeably less after Labor Day. Only a few canoe liveries are still open and the launch site parking lots are often nearly empty. Now as we move toward October, the green backdrop of the forested shorelines begins to transform into a dazzling array of reds, yellows, and oranges. The rivers may be the obvious destination for canoe or kayakers this time of year, but lakeshore foliage can be pretty amazing as well. Here’s five of my favorite paddling destinations that are close to home. Pine River – You can’t go wrong with any stretch of this stream. Rated as the second fastest river in the Lower Peninsula, the Pine, with its many twisting turns and occasional stretches of swift, but manageable whitewater, commands your attention. It may offer more challenge than a novice might want to undertake. Putting in at Silver Creek Campground off State Road and continuing down to Elm Flats will easily be accomplished in about two hours. Add a couple more hours and you’ll be landing at Dobson Bridge. Those are my favorite stretches, but the most popular section is the run from Dobson to Peterson Bridge which features the Peterson Rapids. Staying upright through these is quite easy if some basic steering strokes are used. Manistee River – With 140 miles of river from its beginnings near Grayling to where it flows into Lake Michigan, it would take a week to explore all of it. Some of the best parts of the river flow just north of us. If I could pick just one stretch, it would be from Missaukee Bridge to US 131. Each year I take a group of campers through this and we do it in about two hours. We’re paddling right along; if you’d prefer to drift, allow more time. Watch the high banks flank the river, during the peak of the color season, the view is breathtaking. The current is gentle enough that one doesn’t feel it’s too much of a risk to pull out a camera and to record the scene. 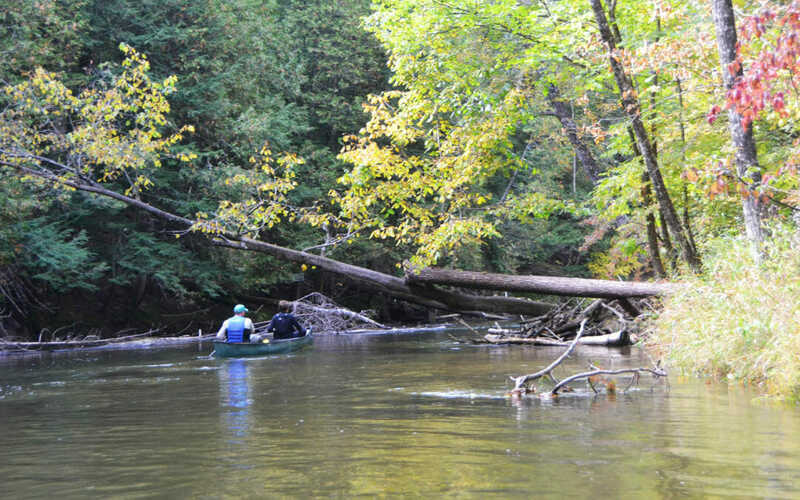 Taking photos from a canoe or kayak on the faster running Pine River feels a bit more dicey. If you’re on a river, be sure your camera or phone is in a waterproof container when not in use. Olga Lake – Ask most who live in the Cadillac area about Olga Lake and the response is invariably “Olga Lake? Where’s that?” Take M55 west to 25 Road. Go left and follow 25 for several miles until you see the lake and a sign that says “5592.” Created when a creek was dammed, this small lake has a surprising amount of area for paddling with bays and islands to explore. Eagles, osprey, swans, Canada geese, and various ducks call it home. Birches and maple light up the shoreline with the best of fall color during October.  RELATED: Explore Fall Color in Cadillac this Season! Tippy Dam Backwater – Here you’ve got 9000 acres to explore and there’s so many bays, narrows, and islands that if you bear to the left on your way up and return along the other shore, you’ll feel like you’ve completed a loop rather than done an out-and-back trip. Launch from the landing at Red Bridge and head downstream. Don’t worry about having to buck the current on your way back, the river is wide and flow is gentle. If the purpose of my trip is to capture digital images of autumn splendor, this is where I go. Red Bridge is also the end point for paddlers coming down the river from Hodenpyl Dam. As you might expect, the color along that section of river is impressive. Lake Mitchell – in the early morning the golden light of the rising sun, does amazing things to the trees lining the west shore of the lake. With a fishing rod, in hand, I move slowly down the lake catching the beauty of the season and hopefully some fish. While you can launch from sites around the lake, putting a boat in at Little Cove puts you in the center of the action. Be sure to check out Big Cove and the canal that goes inland from the north shore. Lake Cadillac offers good color but the road around much of the lake puts the foliage back a bit. Up in the Lake City area, take a look at Crooked Lake, Sapphire Lake, and Lake Missaukee. If you’re on a lake the best time to view the colors is the ends of the day as the low angle of the sun seems to boost the intensity of the color. Being out when the morning mist is rising off the lake, creates opportunities to capture a calendar type shot. If you’re heading to a river, go in the middle of the day before the shadows dampen the color on the shoreline trees and the air cools. Need to rent a boat for fall paddling? Check out a local Livery. Need a place to stay in Cadillac? Check out our local lodging.